Food. Clothing. Shelter. The three basic elements of human life. These three words hold special meaning in Japan where life was long a struggle for survival. How has the meaning of food, clothing and shelter changed from ancient times to the present day? In school, we learned what people of privilege and influence ate, what they wore and how they were sheltered for there are plenty of documents and artifacts about the privileged classes left behind in museums. The wealthy were, however, only a small percentage of the whole population. Whereas the majority?the common people who lived their lives by using their own wits and ideas?are rarely presented. Not much is known about how they lived from day to day in Japan or about their spiritual life, and so forth. Through clothing, however, a lot can be learned about Japanese art and culture. Clothes worn by men of importance like aristocrats, feudal lords, warriors and the gentry are well researched, and much has been learned from costumes worn by Noh actors depicting members of the upper classes. Garments painstakingly made with advanced techniques represented the wearer’s high status. They are carefully preserved as great works of art. Consequently, those elegant fabrics became synonymous with Japanese textiles. What on earth, then, were the common people’s clothes like? Rarely featured in folklore or in the history of dyeing and textiles, their clothing was never fully brought to the foreground. It seems as if they have been left unexamined and even omitted from history. We have a tendency to think that long ago the common people wore clothes made of cotton, but it wasn’t that long ago that cotton first became available in Japan. Cotton seeds are said to have been brought to Japan from India for the first time in the 8th Century. Afterward, there was a long stretch of time that cotton was not harvested for the making of cloth. In the 13th- and the 14th-centuries, a small amount of cotton was imported from China, but the common people couldn’t afford such a rare and expensive commodity. It is believed that it was in the mid- Edo period (c. mid-18th Century), that cotton began to be harvested and from that time forward became available to the common people in the form of cloth. So, what kind of fibers did the common people weave cloth before they could afford cotton easily? The answer lies in the wild trees and plants that grew in the mountains and in the fields: paper mulberry, linden, elm, wisteria, kudzu, banana fiber, hemp, ramie, and nettle. How is thread made from trees and grasses? For trees, the layer between the bark and the wood is peeled and removed, then boiled with ash for a long time, and fermented. Only then can the fiber be taken out. For grasses, after cutting, they are boiled until the outer layer dissolves (hemp) or they are shaved with a blade (ramie) to remove the fiber. The resulting fiber is torn into pieces and tied or braided together piece by piece to create a longer thread. This process is called ply-joining and these fibers are called bast fibers. Cotton is turned into thread by spinning cotton wool. Silk is naturally produced by silkworms. Bast fiber threads that are made from natural trees and grasses are labor intensive and take an incredibly long time to make. What is amazing about some local mountain and fishing villages in Japan is that they made their own work and casual clothes from these plant fibers from the last half of the Jomon period (14,500 BC ? 1,000 BC) to around the beginning of the Showa period (1926 - 1989), when cotton was commonly available. 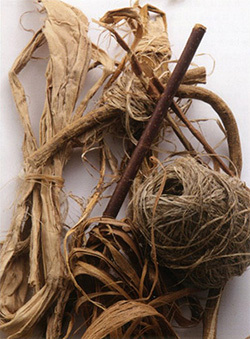 Artifacts from the Jomon period included actual parts of twisted or braided ropes, cloth and various items. “Jo” from the word Jomon means rope. 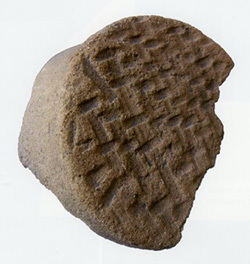 While some earthen vessels found by archeologists had cloth marks imprinted on them, many vessels had a specific rope pattern imprinted on them. In the last half of the Jomon period, the loom appeared. This suggests that they already had the technique to make cloth with threads created from the fibers of trees and grasses. It is said that in those days, they used plant materials such as hemp, nettle, ramie, and elm, to name a few. For a period of about 3000 years, between the last half of the Jomon period and the beginning of the Showa period, people may have tried other plant materials than the ones mentioned above. However, it is believed that those materials proved difficult to make into thread or were not pliable or comfortable enough on the skin to be used as clothing. Eventually, the previously mentioned grasses and trees proved workable and remained in use.